Spending most of her days in hotels and catching flights, professional traveler Kashlee Kurcheran has found the perfect way to stay healthy without a fancy gym membership or home trainer. In fact, she’s a minimalist, so even if she were living in one place her whole life, it is very unlikely she would splurge on that overpriced yoga studio membership. So what is the secret to holding on to healthy habits in Scotland and feeling her best in a bikini in Bali? How does she actually stay healthy while constantly being on vacation? “I am surrounded by treats! Sometimes buffets with hundreds of treats…all calling my name! 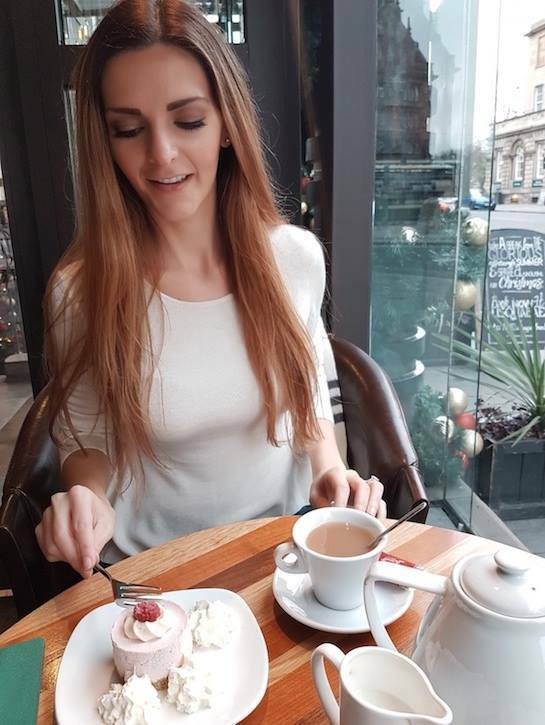 When I first started traveling I would indulge in every treat I saw, but that would leave me bloated, tired, feeling guilty and bursting out of my clothes. I have really been working on learning a healthy balance for when I am on the road,” says Kucheran. Instead she allows herself to indulge in a “cheat meal” once or twice a week.The rest of the week, she sticks to healthy eating and shops locally for food that doesn’t need to be cooked. (Sometimes she doesn’t even have a mini fridge in her room!) Her go-to healthy snacks and meals include natural yogurts, fruit juices, raw veggies, nuts, bananas, granola bars and the like. Touche’. Maybe next time I’ll grab my luggage from my husband to fit in that arm workout. Maybe not. Kucheran explains that many hotels in developing countries do not even have gyms. Therefore, she opts for streaming workouts online with apps like BOD (Beachbody On Demand). There is no need for any gadgets or workout equipment either; instead, she uses her own body weight or an empty carry-on bag for resistance. Another great tip of hers is to bring your own snacks. She always keeps healthy snacks in her purse or luggage that way when she gets hangry, she can pull out a Kind bar or some nuts instead of reaching for that airport brownie. Admittedly, Kucheran acknowledges that staying hydrated is a bit harder than it sounds. Another tip includes asking for half orders. “Most restaurants in tourist areas will pack a plate full of calories. A big plate of pasta with a side of bread can easily be 1300 calories for the one meal! I will ask for half orders and drink tons of water with it. That way I am feeling full, my bill is cheaper, and I didn’t just throw my balance down the drain,” shares Kucheran. Kucheran stresses the importance of mental health while traveling nonstop as well. And although it seems counterintuitive, it is important to create a routine while on the road.